The thought that has been chasing around my head since I finished Blue Remembered Earth is that there's always something of the Volvo about an Alastair Reynolds novel. This assessment is, admittedly, based on an incomplete apprehension of his work—I haven't read his first four books, the meat of the Revelation Space sequence, although I've read everything from Century Rain (2004) onwards and much of his short fiction—but with that caveat I think it holds. At least at novel length, I don't think you could say that Reynolds writes particularly agile fiction, and it would be hard to claim that he is in the first rank of the genre's stylists; but his worlds do tend to have a beefy solidity, and to be meticulous in their detail, and his narratives tend to acquire a certain amount of brute momentum when in full flow. Not uncommonly, said momentum is entirely literal, which can be effective, as in the soaringly lonely final intergalactic chase in House of Suns (2008), or rather less so, as in the dull runaway-spaceship narrative of Pushing Ice (2005); but at this point I think it's fair to say it's an expected feature, part of the Reynolds brand. 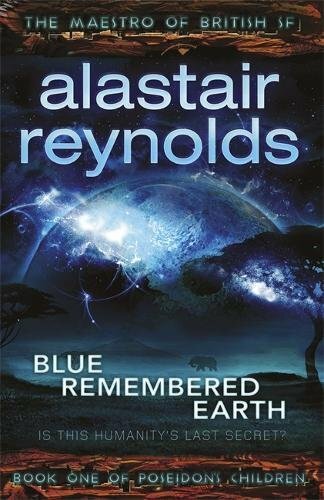 This is not to say, however, that all Reynolds novels are the same: I think they share the goal of sincerely imagining a future we can believe in, but that meticulousness I mentioned guarantees a certain amount of differentiation, and Blue Remembered Earth feels no less thorough than usual. This time out we're just under two hundred years up the line, and of the many trends that have shaped the world, three are of particular significance. First, climate catastrophe led to a grim period known with convenient transparency as the Resource and Relocation years; second, the saturation and domestication of the world with information technology has culminated in a sort of queasily utopian panopticon society (interesting to compare with the more definitely skeptical worlds of Charles Stross's Rule 34  and Ken MacLeod's Intrusion  in that respect: clearly a topic on British SF writers' minds right now); and third, Africa has become a locus of global power, concomitant with the slow integration of its nation states into a few larger political entities. Each of these trends echoes into the novel's themes—environmental politics in a broad sense; freedom or paternalism as routes to societal development; the legacy of a powerful family—and ensures that its present is plainly enough a work in progress. Some of the holes poked in the nominally ubiquitous Surveilled World do feel a little too conspicuously Real Year 2011 ("aug" coverage that fades in and out like a mobile phone signal; the concept of "synching" extended to copies of a semi-autonomous program operating on Earth, the Moon, and Mars), not to mention narratively convenient, and some of the talk about how socioeconomic trends take a long time to play out is pretty clearly setup for the planned exponentiating sequels in the Poseidon's Children series: but the sense that Blue Remembered Earth describes a moment in history, not an end state, is welcome. One of the beneficial things it does, for instance, is help this African moment to feel normalized. When a character glosses Blue Remembered Earth 's geopolitics as "Now it's Africa's turn. The wheel rolls on" (p. 136), he's helping to establish the inevitable logic characteristic of the best future histories: this is just the next thing. When the changing climate led to horrors—in Africa first and hardest, but "that was the case the world over," the narration carefully notes, "it wasn't a uniquely African problem" (p. 149)—it led also to some kinds of opportunity, for the development of energy and other technologies that was seized by Africa, represented for convenience by the entrepreneur-adventurer Eunice Akinya, and the family megacorporation she founded. This is a common enough SF trope that it acts as another kind of normalization, or less charitably a kind of flattening, a risk that Reynolds seems to implicitly acknowledge. "Now and then," observes one character, "even hard-line Akinyas take a break from rabid capitalism to feel guilty about their neglected African heritage" (p. 62). Characters situated so firmly within a familiar socioeconomic paradigm (however different the world may be in some ways) offer an easy point of connection. Moreover the speaker here, Eunice's grandson Geoffrey, is our main window on the world and another type himself: the thirtysomething quiet moral scientist reluctant to come into his heritage. Lest this sound dismissive, for me Geoffrey's story, and his ending, becomes one of Reynolds's most successful novelistic character arcs, his connection to his Earthbound work on the conservation of elephants quietly but firmly underlining the tug of home, providing a stronger than usual counterweight to the outward urge to which SF of this type almost always capitulates. The familiar shadow of Africa as the cradle of humanity lurks behind this, of course, but Reynolds is never so crass as to make the connection explicit, or to make it the only way in which culture inflects his characters' lives. Geoffrey's sister Sunday, the novel's secondary viewpoint character and an ex-pat artist working on the Moon, finds that to make ends meet she must ruefully accept commissions for "an ethnic restaurant that couldn't even be bothered to decide which part of Africa it was supposed to be parodying" (p. 145). Increasingly post-national this Africa may be, but that doesn't mean it's become a monoculture. Blue Remembered Earth takes the argument that our home planet is a grounding context for humanity, and asks how changes in that environment might drive changes in human society. One character puts Eunice Akinya's life in context by describing how the Earth's climate changed over the course of her life, partly by her actions: she was born when the snows were gone from Kilimanjaro, we're told, and she died after they returned. More specifically, like Joan Slonczewski's The Highest Frontier (2011), Blue Remembered Earth tries to imagine what a politics driven by environmental issues might look like; all the major power blocs in the book have such considerations in their DNA. The creation of the Surveilled World is one response, for instance: the horrors of Resource and Relocation engendered a conviction that humanity cannot be trusted, that too often its impulses are damaging, that it must be taught, guided, shaped into something better. The competing response is explained when Geoffrey goes to visit Sunday on the Moon, in the Descrutinised Zone that rejects the benevolent control of Mechanism. Sunday takes Geoffrey to see two other biologists, Chama and his husband Gleb. Their philosophy is Panspermianism which, as they explain to Geoffrey, means that "the human species has a duty, a moral obligation, to assist in the proliferation of living organisms into deep space. All living organisms, not just the handful that we happen to want to take with us" (pp. 98-9). They call it the Green Efflorescence: to Geoffrey, their project to create dwarf elephants that can live in space habitats seems not a liberation, but a profound cruelty: "Elephants aren't born into a vacuum: they're born into a complex, nurturing society . . . What you're doing here is the equivalent of dropping human babies into isolation cubes!" (p. 102). But the panspermians have a point, too, when they describe the Surveilled World as a garden, no longer natural in any meaningful sense. There's more to the various factions that clash over the course of this novel than just this divide, but this question—what would it mean for humanity to be an environmentally mature species?—is potent. It's a shame, then, that all of this starts to get run over by the plot. The first two hundred pages or so of Blue Remembered Earth certainly have a clear narrative hook—the death of Eunice has triggered a sequence of events that we can tell will reel Geoffrey back into the affairs of his family, to confront its legacy—but are nevertheless a pleasingly relaxed, digressive experience: there's a sense of daily life. But at a certain point this excuse to tour the world becomes only a treasure hunt, too obviously given momentum by the hand of the author; and sure enough, after another couple of hundred pages our heroes find themselves on a secret spaceship, zooming across the solar system in pursuit of the final plot reveal. To be clear, the thriller model per se isn't the problem here. Reynolds executes it as well as he ever has—as well as, say, The Prefect (2007), which is almost all thriller (and only a doodle in the margins of a more comprehensive future history)—and there's certainly a technical achievement to be admired in building a runaway narrative out of a world in which violence is theoretically impossible. And ultimately Blue Remembered Earth comes to rest in what is the best-judged Reynolds ending I've read. But before then, the thriller took me away from other elements of the novel I was enjoying: it made everything seem more functional, and less textured. I would have been content to simply follow Geoffrey Akinya, living in the world, being in the world, a bit longer. Maybe all of this only amounts to saying that I want an expertly crafted Volvo to be something it's not; but it leaves me with a sense of regret nonetheless. Hmmm. That is interesting, because I've gotten behind on reading Reynolds, so I've only read the first novels. And I would say there's a fair amount of agility there. So the obvious question is: are we meaning the same things when we say 'agile'? When I say it, I'm thinking of stories that turn and shift and sparkle as you read them; it implies for me both lightness of touch and precision. I'd say Genevieve Valentine's stories, or Geoff Ryman's, are pretty agile; Frances Hardinge's novels; The Quantum Thief. You? You haven't read the Revelation Space novels and we are supposed to read a word that you are writing about Blue Remembered Earth? That's like reviewing Peter Freaking Hamilton and saying "I haven't read his Night's Dawn series or the Judas Unchained/Pandora's Story duopoly but...." That's a pretty big but there, dude! If you haven't read the best of what an author has written how can we be expected to accept your overall evaluation of the writer's ability? Books don't just exist in a vacuum, especially if the author is not a first-time novelist. 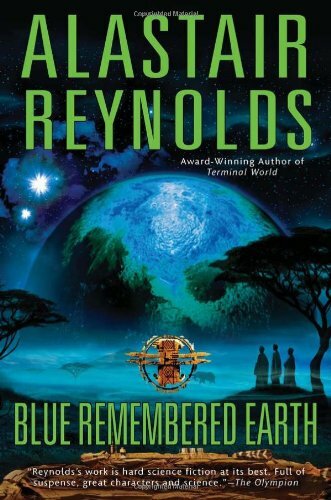 That being said, I'm a huge fan of Reynolds (and have read everything he's written EXCEPT for the short fiction) and I would say Blue Remembered Earth is pretty middle-of-the-road Reynolds, but there is great potential for the series. It's probably not going to be top flight stuff, because the central character (Geoffrey Akinya) is a bit flawed (and annoying) for wide appeal, but if Reynolds focuses on the diffusion of humanity out into the stars over a 10,000 year time frame this could be a series to watch.